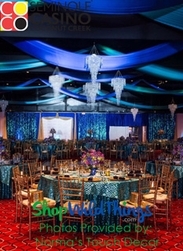 The large multi-faceted beads on our Diamante Duo beaded curtains, columns, chandeliers and bead strands make any special event or stage set truly spectacular. The premium acrylic crystal beads in two sizes on Diamante Duo de´cor curtains and panels are faceted to sparkle like diamonds. Our how-to videos at ShopWildThings demonstrate how easy they are to install. Choose from non-iridescent or extra shimmery Diamante Duo bead curtains with a pearly iridescent finish. Lengths range from 6 feet to 24 feet. Choose 2-foot or 3-foot widths. The beads are .5 inch and .75 inches in diameter. We make these elegantly crafted curtains and chandeliers available in gorgeous colors. You can also custom-order our diamond-cut beads curtains with different sizes of beads and flexible rods to wrap around curved walls or uneven outdoor party pavilion fixtures. Our Bliss collection of 2-foot by 12-foot Diamante Duo iridescent columns each has 64 alternating strands of crystal-cut ball beads (32 strands) in 8-foot lengths and diamond-facet acrylic crystal beads (32 strands) in 12-foot lengths. 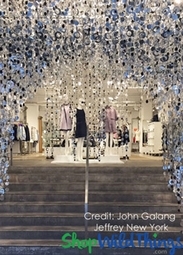 With a 15-inch hanging chain, the total length is slightly more than 13 feet. 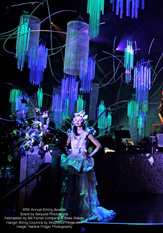 Event planners and the entertainment industry love the versatility of our 2-foot by 8-foot crystal curtain panel with 16 strands spaced 1.5 inches apart. This beaded curtain panel has rods at the top and bottom. Hang with c-hooks or magnetic hooks on walls, as room dividers or as backdrops. 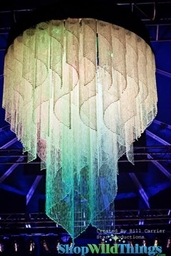 You can also create a draped beaded ceiling canopy. Create a beautiful wall drape by hanging curtain rods about 7 inches apart. 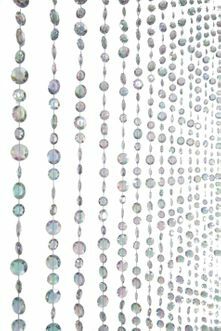 Choose pearly iridescent or sheer non-iridescent acrylic crystal bead curtains. Our colors include pink, smoke, root bear brown, champagne, purple, silver and red. Fans are applauding our new Pussycat Diamante Duo beaded curtains with acrylic crystal non-iridescent diamond-facet bead strands and faux Capiz shell bead strands. Each diamond-shaped bead strand cascades from the rod in 1/2-inch and 3/4-inch sizes. The faux Capiz strands have 2-inch and 1 1/4-inch circular discs that mimic the look of exotic Capiz shells. Browse our elegant Diamante Duo chandeliers with a 10.25-inch diameter and 33.5-inch length. The Dazzle chandelier has a 24-inch diameter, and the Marbella iridescent diamond-cut crystal bead chandelier has a 25-inch diameter with 18-inch length. Create a dramatic focal point with our Cascadia 5-tier metallic silver and crystal bead chandelier. It's 7 feet long. 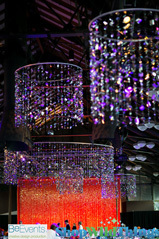 Celebrate romantic occasions with the Pussycat red disc and red diamond-facet chandelier. It's 11 inches in diameter and 3.5 feet long. View our how-to videos on installing optional light kits inside chandeliers or LED light saucers on top. We carry beautiful table risers and centerpiece boost kits for chandeliers, too. Complement your layout with creative use of our Diamante Duo crystal non-iridescent and iridescent beads by the roll. 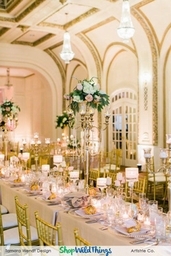 Choose 22 yards or 50 yards to weave through centerpieces, decorate side tables, drape from chandeliers or add elegant flourishes to entrance decor.